The MDS University conducted the BSTC pre examination test on May 8, 2016. Over 5 lakh students registered for the examination out of which 4,78,818 appeared for the BSTC exam. 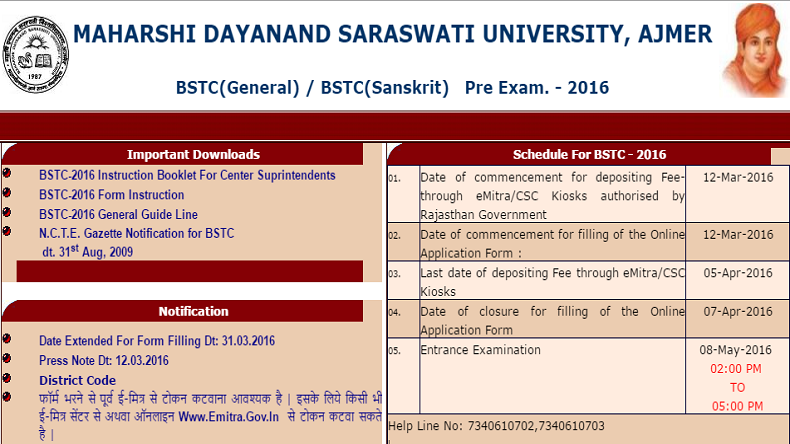 Click on the link BSTC-2016 Result. The result will be displayed Check and take a print out. The Maharshi Dayanand Saraswati University, Ajmer is a comparatively young University of the country which came into existence on 1st August, 1987. Ever since its inception the University has for the last 25 years never settled for a slow pace – it has steadily and successfully marched on the road to development attaining several milestones during its journey of growth and progress.